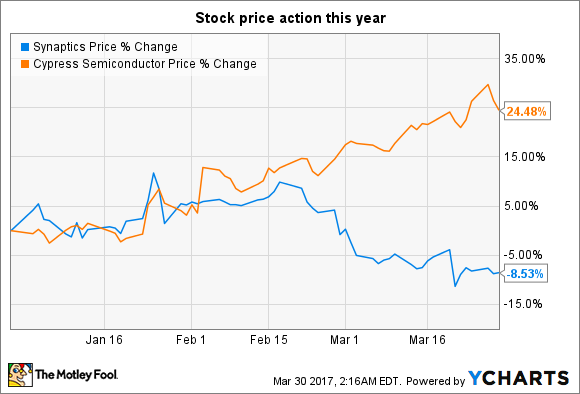 The two semiconductor specialists have enjoyed varying fortunes in the market this year, but does this make one of them a better buy? Cypress Semiconductor (NASDAQ:CY) stock shot up almost 25% in the first three months of 2017, thanks mostly to a strong fourth-quarter report and terrific guidance. What's more, the semiconductor specialist's product development moves to target the Internet of Things (IoT) and connected cars seem to be inspiring confidence among investors, pushing Cypress to 52-week highs. Meanwhile, Synaptics (NASDAQ:SYNA), which provides technology that helps people interact with their devices, is having a difficult time as it has lost over 8% of its value in 2017. 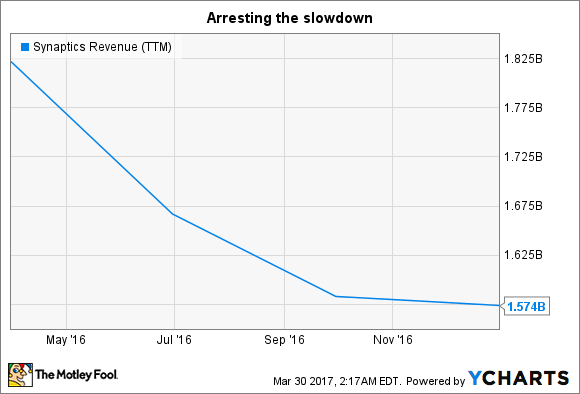 The company has struggled despite posting better-than-expected results earlier this year and is languishing close to its 52-week low. Does Cypress' momentum make it a better bet? Will Synaptics make a comeback? Which looks like the better buy? Let's take a look. Cypress has a lot going for it in the smartphone, automotive, and Internet of Things markets. The semiconductor specialist could land a chip spot in the upcoming iPhone thanks to its expertise in Type-C power delivery, as Apple is expected to integrate the fast-charging feature this time. Investment research firm Needham and Company believes the next iPhone will boost Cypress' revenue by $122.5 million at the mid-point and enhance earnings by $0.15 per share. That would give it a good shot in the arm going into the latter half of the year, but the company's not just relying on an iPhone win to drive its long-term performance. Cypress is aggressively trying to tap the connected car market with its Traveo family of microcontrollers, and it has already made some progress in this space. Tier 1 automotive component supplier Continental AG of Germany has decided to use Cypress Traveo II microcontrollers to enable comfort and connectivity functions in cars. These microcontrollers will help Continental customers configure controls for seats, doors, windows, and wireless charging. This design win could be a big deal for Cypress as the German components supplier is among the biggest automotive component companies on the planet, with revenue of more than 40 billion euros last year. The Internet of Things is another area where Cypress is trying to cut its teeth by launching new microcontrollers and wireless solutions. The company's latest microcontroller architecture focuses on low power consumption and security -- two key features that IoT devices need. The semiconductor opportunity in the IoT space could be worth $30 billion by 2019 if estimates from IC Insights are to be believed, giving Cypress a huge market to tap. Synaptics is showing some signs of a turnaround as its revenue decline has slowed of late, thanks to an improvement in both its PC and mobile businesses. The company's revenue was up 19% on a sequential basis in the second quarter, with the majority of the growth being driven by mobile as it accounts for 86% of the top line. Synaptics' turnaround is driven by the increasing adoption of its touch and display integration (TDDI), as revenue from this product line shot up 40% last quarter. What's more, Synaptics' expertise in the TDDI space could possibly lead to a design win in the next iPhone if Cupertino decides to eliminate the home button from the device and fingerprint detection is done on the screen itself. An AppleInsider report says that supply chain checks point toward the possible inclusion of Synaptics' solution into the next iPhone as it is "currently the only workable solution for detecting a fingerprint through a smartphone screen." Even though Synaptics has shown improvement, it lacks concrete catalysts. Cypress is a more diversified bet as its automotive revenue jumped 37% in 2016, while recent wins should lead to more gains. Additionally, analysts predict Cypress' earnings will grow at an annual rate of almost 59% over the next five years as compared to Synaptics' growth projection of 12.50%. Cypress looks like the better buy.